The Profit and Loss Statement provided one very important method for monitoring the performance of a business. Let us suppose, that the business in question is a football club which derives a proportion of its income from clubhouse operations and a proportion from running football programs. Maintain a good profit margin on everything sold at the bar. Control costs such as electricity, insurance, telephones, office machinery, printing and stationery, etc. These business objectives provide very good clues as to what information the management committee need on a regular basis. Each month, the management committee should receive and review important information on how well the club is going according to these objectives. 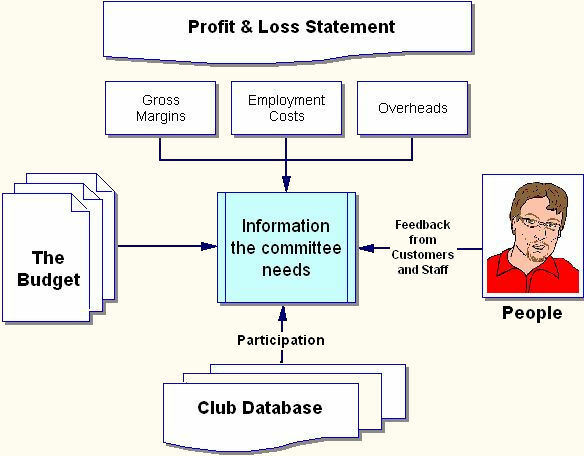 A Profit & Loss Report should be produced each month and discussed at committee meetings. It is a key tool for monitoring and managing the business performance. Take a look at a two page P & L Report for the Black Stump Soccer Club. This Profit and Loss Statement enables us to examine closely how well the club is running in regard to Gaming, Bingo, Bar, Canteen and Football Programs. 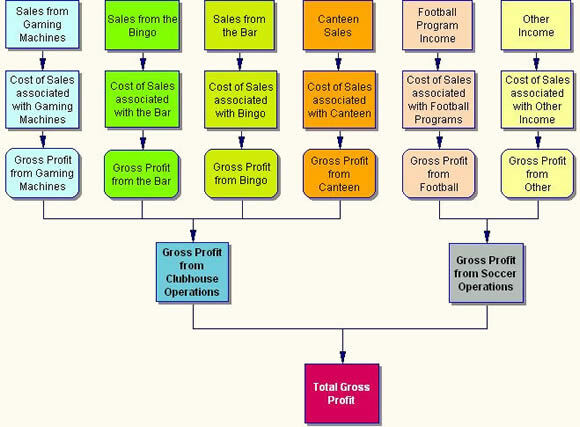 The gross profit margin of 47% is about right and would be expected of a small bar in a soccer club. The income earned from gaming machines is the main source of income in the club. The gross profit margin of 21% is woeful and needs investigation. A canteen would be expected to have gross margin of 50%. This club makes a loss on Bingo every month because the number of patrons is too small to make Bingo pay. However, the club does not cancel Bingo because the patrons also use the Gaming Machines and this is profitable. This club does not charge participants the full cost of the programs and services it provides. This is both a club philosophy and a marketing strategy. Instead, the income from Gaming Machines is used to subsidise the cost of soccer programs. So provided, the accounting system is set up correctly, and financial data is inputted correctly, there is key information in the Profit and Loss statement that enables managers / the management committee to monitor the business performance. This key information is much more than simply the "bottom line" i.e. the Net Operating Profit. In the above example, the management committee should investigate the Canteen operation, as something is not right. Most items in a canteen are sold at double the price of the purchase price and more. Furthermore, managers / the management committee should keep an eye on the loss sustained by Soccer Programs. At this sim months stage, the loss on Soccer Programs is $43,366 which is considerably less than the net income gained from gaming machines of $76,703. Therefore the management committee are in control of the costs of the Soccer Programs.